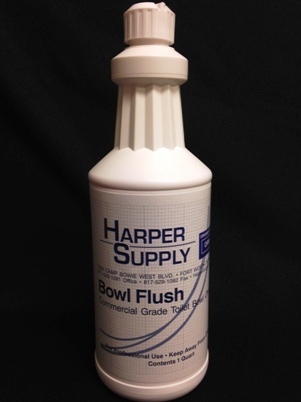 Bowl Flush is a ready to use toilet bowl cleaner. Bowl Flush safely and effectively attacks and dissolves calcium. Phosphoric acid, detergents and wetting agents unite to quickly remove water minerals, scale, rust, soap scum and filth from your toilet. Will not attack chrome or carpeting like other acid cleaners. Safe on porcelain. This formula is inhibited to protect plumbing and all metallic surfaces and will not harm septic tank action.